The Dynotek Slimline “G” Submersible Pressure Transducer is a highly reliable and accurate unit designed for long term submersion in water wells, wet wells, tanks, cisterns and flumes up to 100 feet deep. It is a vented gauge configuration, giving immunity from pressure variations due to altitude and atmospheric changes. Slimline “G” is only 0.69 inches in diameter, making it easy to insert into sounding tubes, an access hole in a pump base, or into one-inch diameter stilling well tubing. Surface mount electronics with the 316 stainless steel body tube assembly enables minimum sensor size with improved reliability. 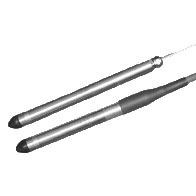 The vented electric cable results in a depth and level sensor with the highest integrity at low cost.